This pasta story begins with leftovers. I know it's not a very glamorous place to start. But things, incidents and even recipes have to begin somewhere. For this pasta, it's story started when I opened the fridge, one late Sunday morning, totally hungover and groggy. It was a bright & sunny day and sunlight was cheerily streaming in from the windows. Other days the sight of sunlight cheers me up no end, but that day all I wanted to do was to crawl back to the bed and pull the duvet over my head and go back to sleep. In case you are wondering why I did not, it was my growling tummy. My body required no demanded nourishment and it was refusing to let me sleep. I was desperately hungry. All my desperately hungry moments lead straight to the fridge, for that is the store house of our perishable foods. Sadly for me that day the fridge revealed not much cooked food. A half eaten naan from an Indian take-away from a few days back, some sad looking grilled asparagus and some soggy garlic bread from last evening and that was it. I know not a very food blogger-ly kind of fridge, but hey we all have our weak food moments. But all was not lost. There was other stuff in there like a few olives swimming in herbed olive oil, a fat red chilli and 2/3 pods of garlic looking all cheerful and giggly, some sun-dried tomatoes looking all wrinkled and red, a few remaining grilled peppers looking slippery and sly and some parmigiano reggiano cheese looking white and pristine. There was also some succulent chorizo sausages which screamed 'eat me' the moment my eyes fell on them. Now any other day I would have made a sandwich with all of this. But that day I was craving something starchy and spicy. I frankly do not know what I craved more, the starch or the spice. But it was a mighty strong craving. The kind of craving which just cannot be ignored or unceremoniously shoved aside. They say necessity is the mother of invention. I say whoever realised that must have had a similar hungover moment like me. I dragged all the antipasti stuff out of the my fridge. While looking at them with a bleary eye, a shaft of pain shot through my head. Whoever told you that mixing drinks is a good idea? Darn! Frankly they, the antipasti looked rather sad and forlorn. Yes even in the sparkling sunshine.The pounding head can be a big turn off. Then suddenly something happened, my growling tummy kicked some half asleep braincell mighty hard. I suddenly had this idea of making pasta with all the leftovers. It was one of those eureka moments you hear/read about so much. But I did not shout eureka, I did what all good food bloggers do. I frantically searched for pasta in my cupboard and found half a packet. Then I said eureka and got cooking! Okay enough about me, let's concentrate on the pasta. 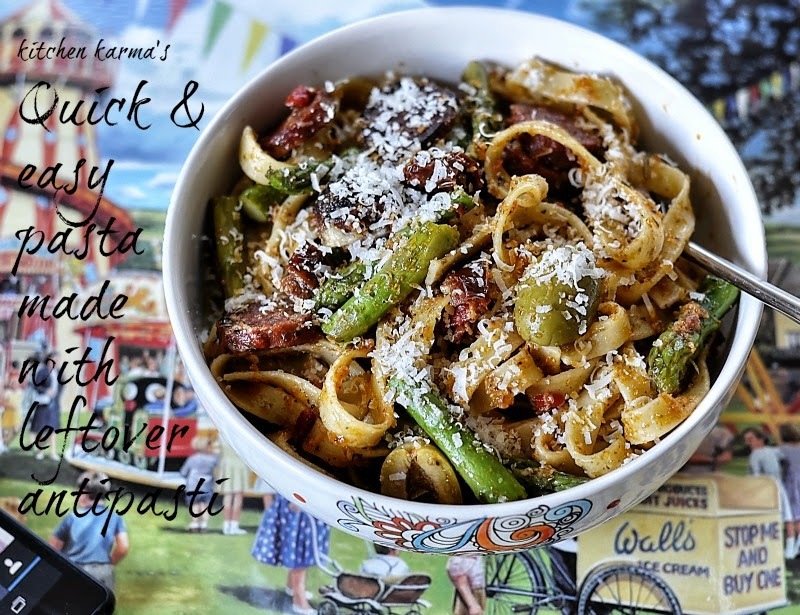 It is indeed a leftover pasta, and so gloriously easy to make that it is a laugh. Yes an easy breezy, on your face kind of laugh! Easy how, I hear you asking me? Will tell you in a jiffy! This recipe is perfect to use up leftover antipasti. 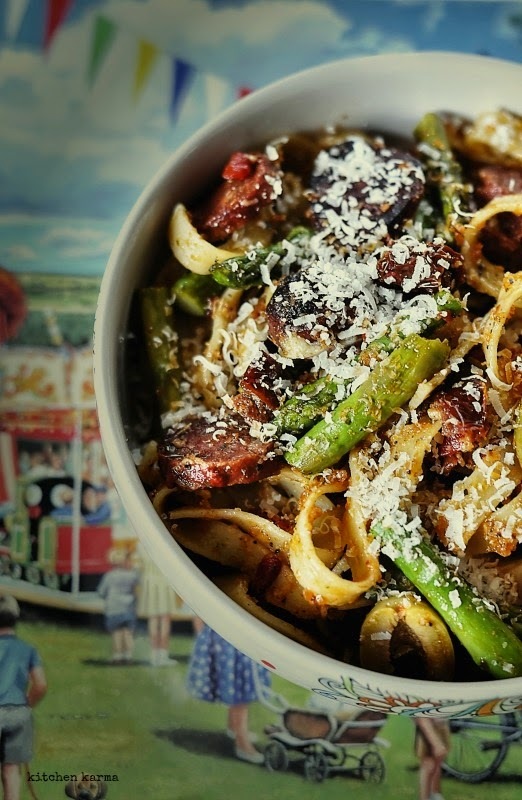 This time round I used olives, sun-dried tomatoes, grilled red peppers, grilled asparagus, chorizo sausages, garlic bread and even the garlic pods, red chilli and olive oil which comes with the olive. Why waste good stuff I say! It is an easy and forgiving recipe, just alter it according to whatever antipasti leftovers you have. 1. Get the pasta to boil in a salted hot water. Follow the instructions at the back of the pasta packet. 2. In a heavy bottomed pan, add the olive oil and the garlic. Once the garlic starts to sizzle, add the sliced chorizo pieces and the red chilli slices. 3. Fry the chorizo pieces till they start oozing out oil and brown on the edges. 4. Add the grilled peppers and the dried Italian herbs. I had minced the peppers finely as I wanted that to be the sauce for the pasta. Cook for a couple of minutes. 5. Turn off the heat, add the drained pasta, the asparagus, and the olives and mix well. 6. Now add the grated parmigiano reggiano cheese and the bread crumb into the pasta and mix well. Taste the pasta, adjust the seasoning if needed. If adding dry chilli flakes , this is where you add it. Your pasta is ready. There, that wasn't too difficult, was it? With the bowl and a coffee mug brimming with prosecco, I toddled towards the couch and sank in mercifully. The remote was lying just next to me, so turning on Netflix was a breeze. While Alicia and Will in The Good Wife made love on screen, I ate & drank. And purred with pleasure. No guys am not a cat. Just a happy pasta eater who can purr like a cat when pleasured! Mouthwatering !! you make me want to go and cook some spicy garlicy pasta !! Wowie!! I want to fly to you right now and have a go at your fridge!! Thank you for thinking of me dear.......loved it as I do all your posts! !